Now that region play has arrived through most of the state, the games take on a whole different level of importance in terms of playoff positioning. That puts the Week 5 top performers in an even brighter spotlight. The list of elite individual performances from all across the state this past weekend is long, so as we do each week, based on the available information at the multiple sources we can access for stats, here are some of the top performances…. Bronson Barron (American Fork) connected on 30-of-42 passes for 401 yards and an amazing seven scores to lead the Cavemen (1-0 Region 4, 3-2 overall) to a 56-20 victory over Westlake (0-1, 0-5). Daisean Cash (Hunter) completed 28-of-40 passes for 427 yards and five touchdowns as Hunter (1-0 Region 2, 2-3 overall) opened Region 2 play with a 42-21 win over Cyprus (0-1, 2-3). Tommy McGrath (Skyline) hit on 14-of-25 passes for 413 yards and five scores to lead the Eagles (3-1) to a 42-28 victory over Brighton (4-1). Brady Hall (Mountain Crest) was 12-of-16 passing for 277 yards and three TDs and ran it 26 times for 102 yards and a score to lead the Mustangs (1-0 Region 12, 5-0 overall) to a 38-20 win over Ridgeline (0-1, 2-3). Harrison Creer (Olympus) passed for 308 yards and four scores to lead the Titans (1-0 Region 6, 3-2 overall) over West (0-1, 2-3) 45-42. Romeo Johnston (West) was 37-for-53 for 487 yards and five TDs for the Panthers in the loss to Olympus. Cammon Cooper (Lehi) completed 23-of-36 passes for 362 yards and four scores to pace the Pioneers (3-2) to a 51-33 win over Maple Mountain (0-5). Brock Jones (Lone Peak) was 19-of-29 for 244 yards and four touchdowns in leading Lone Peak (4-1) to its 42-24 win over Kearns (4-1). Nick Freeman (Ogden) passed for 321 yards and four touchdowns on 15-for-23 passing to lead the Tigers (1-0 Region 11, 2-3 overall) to their 42-35 win over Bonneville (0-1, 1-4). Kael Atkinson (South Summit) connected on 19-of-26 passes for 272 yards and two scores to lead South Summit (1-0 2A North, 5-0 overall) to a 55-20 victory over American Leadership Academy (0-1, 1-4). Hayden Reynolds (Summit Academy) was 16-for-23 for 272 yards and three touchdowns as Summit Academy (1-0 3A South, 5-0 overall) shut out Manti (0-1, 2-3) 28-0. Jackson Siddoway (Sky View) threw four TD passes for the Bobcats (1-0 Region 12, 5-0 overall) in a 27-3 win over Bear River (0-1, 3-2). Crew Wakley (Jordan) ran for 187 yards and two touchdowns, and passed for 199 yards, leading the Beetdiggers (4-1) to a 33-7 win over Springville (2-3). Austin Bartholomew (Weber) passed for 200 yards and ran for 113 more as the Warriors (2-0 Region 1, 4-1 overall) won a non-region contest against Viewmont (3-2) 37-17. 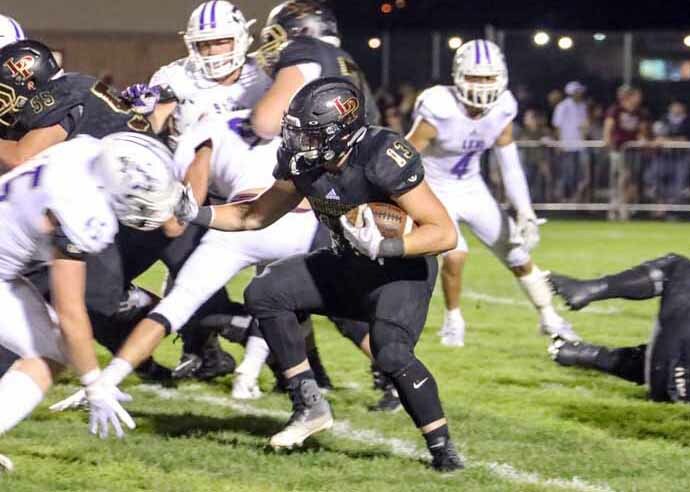 Carsen Manookin (Lehi) ran 21 times for 222 yards and a touchdown in Lehi’s victory over Maple Mountain. Masen Wake (Lone Peak) carried 15 times for 190 yards and a score as the Knights got past Kearns 42-24. Silas Young (Stansbury) ran 24 times for 169 yards and three TDs to pace the Stallions (1–0 Region 11, 2-3 overall) to a 35-28 win over Tooele (0-1, 2-3). Sese Felila (Kearns) ran for 146 yards on 21 carries as the Cougars dropped their first contest of the season to Lone Peak. Carter Green (Weber) carried 25 times for 185 yards and three scores in Weber’s win over Viewmont. Pailate Makakona (Hunter) rushed 13 times for 128 yards and a TD and pulled in four passes for 88 yards in Hunter’s win over Cyprus. Rance Jensen (Emery) ran for 170 yards and a touchdown on 25 carries as Emery (0-1 3A North, 0-5 overall) lost to Judge Memorial (1-0, 3-2). Sione Molisi (East) scored four TDs on 13 carries for 134 yards as the Leopards (1-0 Region 3, 4-1 overall) overpowered Taylorsville (0-1, 2-3) 64-19. Braedon Wissler (Bingham) ran it just six times, but picked up 119 yards and two scores as the Miners (1-0 Region 4, 5-0 overall) beat Pleasant Grove (0-1, 0-5) 44-14. John Abercrombie (West) ran for 53 yards and a score, and caught 12 passes for 175 yards and another TD as the Panthers dropped a tight game to Olympus. Jacob Mpungi (Pine View) picked up 194 yards on 25 carries as the Panthers (0-1 Region 9, 3-2 overall) lost a key region game to Snow Canyon (1-1, 4-1) 27-20. Kade Moore (Lehi) had 13 receptions for 279 yards and three TDs as the Pioneers knocked off Maple Mountain. Colin Reid (Maple Mountain) caught five passes for 175 yards and two scores for Maple Mountain during the loss to Lehi. Irving Gastelum (Ogden) pulled in seven passes for 228 yards and three touchdowns in the Tigers win over Bonneville. Chase Roberts (10 receptions, 169 yards, two TDs), Farrell Dean (9-126-3) and Tyler Traveller (9-95-1) all had big pass catching days for American Fork in its win over Westlake. Saione Matagi (14 catches, 156 yards, TD) and Taylor Larsen (6-150-3) had big receiving days as Skyline beat Brighton 42-28. Chad Yorgason (Green Canyon) had six receptions for 222 yards and three scores in the Green Canyon (1-0 Region 12, 2-3 overall) 39-27 victory over Logan (0-1, 1-4). Nick Nethercott (Mountain Crest) caught three passes for 164 yards and a pair of touchdowns in the Mustangs win over Ridgeline. Brigham Trowbridge (Lone Peak) picked up 103 yards and scored three TDs during the Knights win over Kearns. Johnson Hansen (East) delivered 11 tackles and three sacks in the Leopards’ win over Taylorsville. Wyatt McNeil (South Summit) had two sacks in the South Summit victory over ALA.
Devon Poll (Clearfield) had three sacks in a Clearfield (1-2 Region 1, 3-2 overall) loss to Northridge. Hodgson Jack (17 tackles) and Ryder Vance (three interceptions) led the Olympus defense in its 45-42 win over West. Chris Daley (Orem) had two interceptions as a strong Tiger (3-2) defense keyed a 35-6 win over Provo (3-2). Kaleb Ashdown (Timpanogos) had two interceptions as the Timberwolves (5-0) took care of Uintah (1-4) 37-7. Parker Grajek (South Summit) had five catches for 73 yards and two TDs and also contributed a pair of interceptions in a great two-way performance during the win over ALA.
Lawrence Yarbrough (Northridge) caught five passes for 125 yards and a score, and had two interceptions on defense as the Knights (2-1 Region 1, 3-2 overall) took care of Clearfield (1-2, 3-2) 31-7.